Over the past few days we have taken reports of vehicle burglaries in the Mullica Hill Farms, Brookside Way and the Hunters Creek Developments. All vehicles which were entered were unsecured and valuables were left in plain sight. To help prevent vehicle burglaries please see the tips below. -Most thefts occur when valuables are left unattended in an unsecured vehicle. privacy to commit his/her act. Virtually any article left in plain view is apt to be stolen. -Who provides the burglar with the opportunity? The victim provides the burglar with the opportunity by leaving their vehicle unlocked or their window open. -Most property stolen is left in plain view where anyone walking by the car can see it lying there. -What are their favorite targets? Anything of value. The property most preferred is cash or loose change that is left in the console or ashtray of the vehicle. -They also like wallets, purses, cellular phones, radar detectors, radios and speakers. -When do vehicle burglaries occur? Most vehicle burglaries occur at night while the vehicle is parked outside the victim’s residence. Some burglars also target vehicles that are parked in parking lots while their owners are at work, in class or shopping. They know it’s going to be a long time before the owner returns to their car and the likelihood of being caught is low. -Remove visible items from your vehicle: If you leave items visible in your car, you are a target. Be aware that someone may be watching as you put a wallet, purse, or cell phone under your seat, especially at a gym. Take these with you or secure them in your trunk. 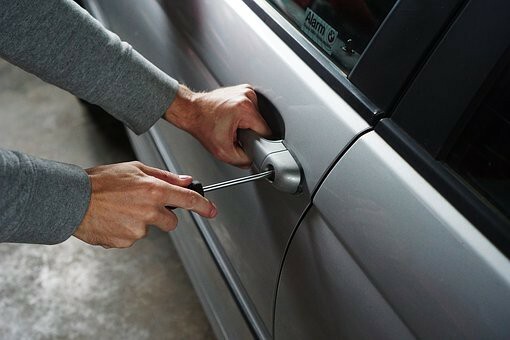 -Lock your vehicle and take your keys, even for quick errands. -Lock the trunk, hatchback or tailgate to block access into the vehicle. -Close all windows, including vent or wing windows and sunroofs. -Vehicle alarms — Buy an alarm and use it! Many people believe that alarms no longer make a difference however, they do remain an effective deterrent to a burglar. -Do not attach personal information to your keys. If your keys are stolen, having your personal information or vehicle license number attached only compounds the problem. A criminal now may have access to your home, automobile or office. -Mail: Do not leave outgoing or incoming mail in your car, especially where visible. This has your name and address on it. -Garage Door Opener — Avoid leaving this in your car if possible. -Avoid announcing your vacation on social media. It is easier than you think to look up your address. -At home, park in your garage if you have one. Lock your car and all garage doors. -Park in a well-lit area. -Check to see that your vehicle is visible from pedestrian and vehicular traffic. -Record the serial numbers and other pertinent information such as make a model for your electronic devices (GPS, laptops, tablets) and cell phones. -Familiarize yourself with the features of your devices, some have the ability to be tracked if stolen. Knowing how to activate this service quickly can greatly help law enforcement recover your property and arrest those responsible. Remember, only you can prevent vehicle burglaries by removing your valuables from your vehicle and locking them in a safe place. Help us to protect your property.